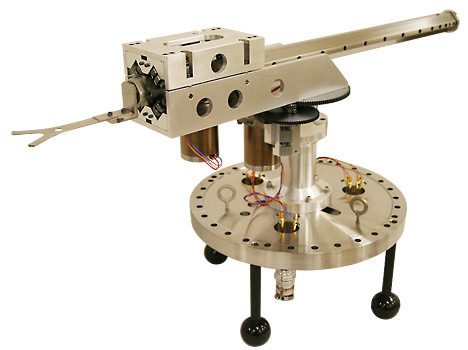 The Model DMRAP, UHV compatible two-axis robot can be driven manually using magnetic rotary manipulators from outside the vacuum system, or motorized using UHV compatible stepper motors inside the vacuum system. The Model DMRAP has a full ±190° of rotational motion with better than .01° rotational resolution and repeatability, 0.001" linear resolution and repeatability, and up to 50" delivery distance from the center of the robot. This is designed to handle substrates up to 5 lbs. with minimal droop, The system is bakeable to 200°C. HOME and EXTEND UHV optical limit switches verify positioning. Motorized units can be provided with our Model ALMCS-2 dual axis stepper motor control system with color touch screen HMI for operation through the front panel of the controller or via RS232 communication. Substrate paddles of different size and materials available on request. A small systems company developed and sold lower cost wafer etch systems for wafer fabs where SMIF pod capability was not required. Our customer needed to outfit these etch-instruments with SMIF pod openers that would work with the existing wafer transfer and loadlock system. The existing Versaport SMIF pod opening system provided by Asyst Technologies was modified to allow the pod to be opened using the existing control system. To accomplish this, a rotational table and lift and protection arms were added to match the operation of non-SMIF compatible system. All motions are pneumatically driven and cleanliness of operation is key. These modified openers were installed on high duty cycle production tools delivered to a wafer fab in the Far East. 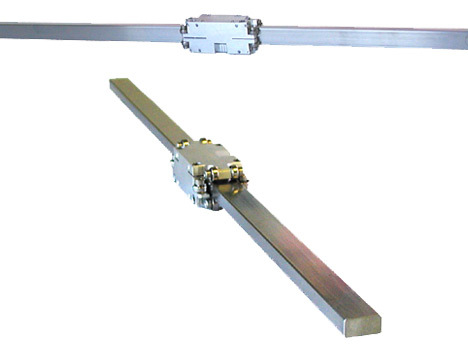 Designed as a part of the TEAM-Mate Loadlock system, this is a UHV linear guide that is bakeable, and clean. It can be used as a guide for stages or any other linear motion in a vacuum system. 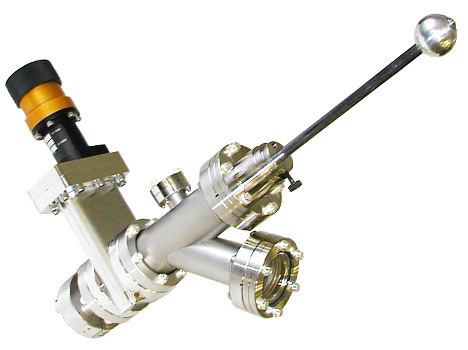 Other high vacuum, linear guides are available but this is a guide that is UHV compatible. 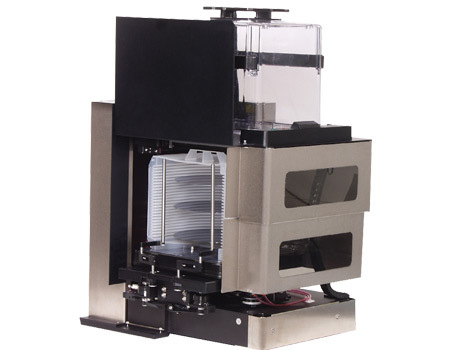 Addition to an existing deposition system for raster and rotation of a sample holder that holds 4" wafers and allow mounting of an existing heater. The sample faces downward in this "sputter up" geometry system that was added to the top of an existing vacuum deposition system. The chamber contains a very robust XY and rotational stage which rasters and rotates a sample holder for 4" wafers. The stages are all motor driven through the wall with magnetically-coupled manipulators. The system was designed to allow the mounting of an existing heater and power and thermocouple feedthroughs and lines were provided for power and to monitor the temperature during heating. A customer with several PHI XPS/AES systems wanted to analyze a sample on one PHI instrument and then transport it to another instrument keeping the sample under vacuum. A "vacuum suitcase" that attached to the existing load lock chamber in place of the standard 'cap' filled this request. This vacuum suitcase consists of a valve, small chamber with a viewport and short manipulator. To operate, with the vacuum suitcase installed and the loadlock/suitcase pumped down, the sample puck is withdrawn into the loadlock after analysis as usual. The manipulator on the suitcase is then lowered to engage the sample puck and lift the puck above the suitcase valve. Close the valve and the puck is under vacuum. Once the loadlock is backfilled, the suitcase can be removed and taken to another instrument with the same loadlock 'cap' or the puck can be stored under vacuum. For longer term storage, a small holding pump could be added to the chamber to maintain vacuum. JPL required an instrument to hold many substrates to test adhesion of dirt. These samples would be taken from the surface of Mars by robotic arms as a part of the Mars Surveyor Program. Samples would then be analyzed by optical and atomic force microscopes. 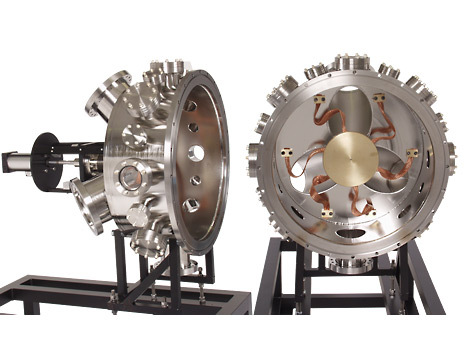 The Sample Wheel/Translation Stage (SW/TS) was developed and delivered to be a part of JPL's Microscopy, Electrochemistry and Conductivity Analyzer (MECA). 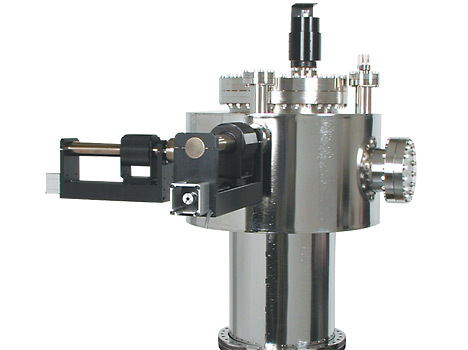 The rotary/linear drive and sample wheel of the SW/TS would allow high resolution positioning of a series of dust and soil samples of a variety of substrates to both optical and atomic force microscopes. This would allow MECA, to image particle morphology, hardness, adhesion and abrasion. 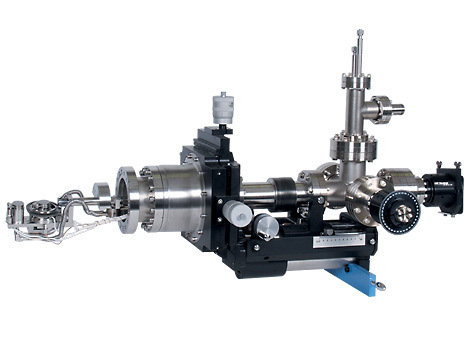 A customer with an MBE system (molecular beam epitaxy) needed to maneuver and position a platen in five directions to monitor surface growth and structure during MBE processes. The unit was to be motorized and high precision was required. The unit must also have heating and cooling capability. This goniometer system was designed for very high precision motion in all five axes (X, Y, Z, azimuthal rotation and polar rotation) and has a wide temperature range of 90°K to 800°C. 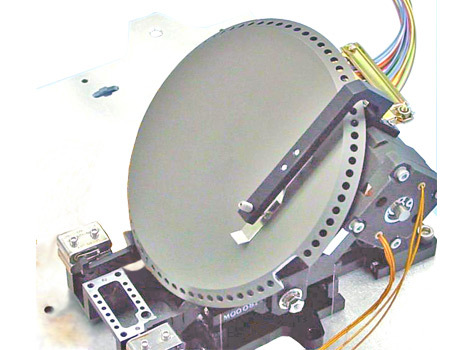 The unique part about this goniometer in comparison to the typical manufacturers unit is that most systems handle little chips of materials. This unit handles an entire 2 inch substrate. A large vacuum chamber with stand was to be added to the UNLV Electromagnetics Laboratory and Pulsed Power Laboratory to be used for research studies on electromagnetic phenomena. The vacuum chamber with stand on the Nevada Shocker, a 50 ns 540 kV 5 kJ (upgraded to 1 MV 15.6 kJ) pulse power device housed at the University of Nevada Las Vegas in the EMITION Center contained in the College of Engineering, was built and in part designed by UHV Transfer. The 2’ diameter 1’ long vacuum head supports 14 vacuum ports on the cylindrical side and four unique ports on the end. UHV Transfer was instrumental in designing the structure to support a 1000 lb air cylinder attached to the vacuum chamber end which applies a force to the anode electrode. A flexible bellows allows for maintenance of vacuum integrity in the chamber. A number of small gas and fiber optics ports exist in the chamber end as well. With suitable pumps, vacuums as low as the upper 10-8 Torr have been reached. The stand supporting the vacuum chamber with cryogenic vacuum pumps offers variability in chamber positioning to the extent that a single person may attach and relocate the chamber with little effort. UHV Transfer is solely responsible for the design of the stand.